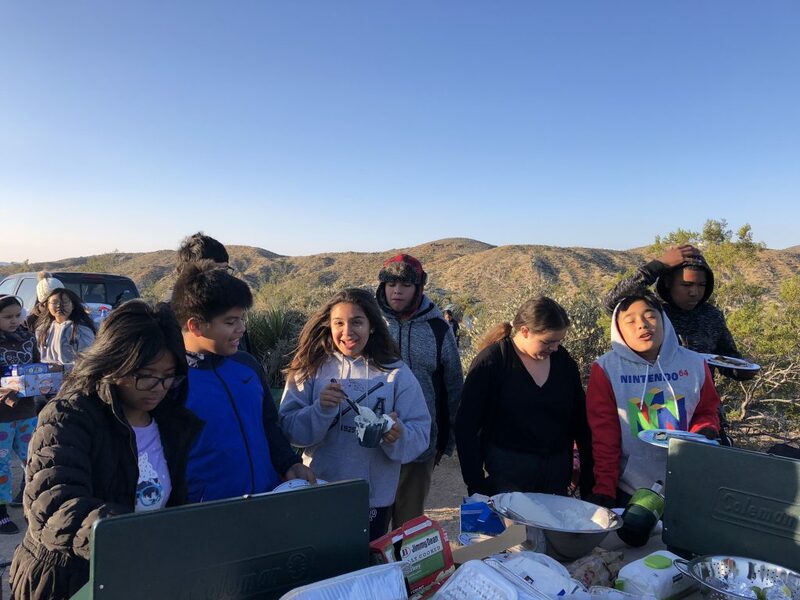 ICO took 21 Stephen White Middle School students on a camping trip to Joshua Tree National Park in November 2018. It was a chilly desert experience! Leaders Ann S., Jason H., & Schuyler S. led the 6th-8th grade students on this trip. The students were so excited to sleep in tents for the first time! It was a windy weekend and students got a real taste of the desert cold. ICO brought sleeping bags, sleeping pads, tents, and even extra fleece jackets to ensure students stayed warm. Their first night was so windy that several rain fly’s almost came off, but the students were smiling when they woke up after surviving their first night in a tent. As the breakfast team began making pancakes, other campers could be heard meeting with students from other tents and asking if they slept through the wind, how cold they got and if they had any snorers in their tent too. Cooking pancakes for a desert breakfast. Students got to experience cooking and dishes outdoors. Each camper was on a meal team and helped slice, heat, rinse or stir to create one of the meals. Several students said that this was their first time cooking anything, and took their jobs very seriously. Campers enjoyed pancakes, hot dogs, mac & cheese, s’mores, tacos, and more throughout the weekend. “Miss, I don’t even eat this well at home,” one student said to his teacher when told there was more macaroni and cheese. Another lamented that he was full but wanted to eat dessert! Throughout the weekend, tired students enjoyed quesadillas, hot chocolate and Cup of Noodles. We made sure the campers were warm and well-fed. This trip was full of new experiences for the students. Schuyler led students on a hike to Mastodon Peak. Brave campers climbed up to see the view while others rested below. Students enjoyed the Ranger Talk on astronomy that included a guest astronomer from the 29 Palms Astronomy Club who brought a telescope. Students enjoyed seeing stars and planets in detail, especially since they can hardly see any stars at night in their neighborhoods. A Ranger came to our campground to give a presentation to the group on local flora and fauna. On the final evening, students shared spooky stories and jokes before heading to bed for a final windy desert night. It was a wonderful weekend that the students will never forget.